Wasting time on YouTube and came up on video of the Goat Man and it got me rolling down memory lane. Old timers from East Tennessee and North Georgia will remember him. His name was Charles McCartney. 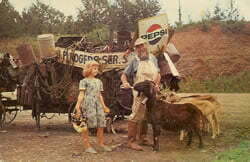 No one around where I grew up knew him by anything other than the Goat Man. The Knoxville News Sentinel would chronicle his progress if he was headed our way, and folks would go out to gawk at him when he was camped nearby. I would tell people over the years that it looked like he hitched some goats to a pile of scrap at the junk yard. I remember asking a girl after mass one Sunday if she wanted to go with me to see the Goat Man as he was camping nearby. I remember being embarrassed when she asked him “How do you clean your teeth?”. I need not have worried as he calmly fielded all questions from the curious. I only wish that I would have gotten one of those postcards he was selling. You can see him in one of the pictures rooting around in a garbage can where he kept his postcard inventory.